During our week 8 term 3 student free day we discussed ways in which to collect and store evidence of student learning. One of these was the idea of using the iPad as a Learning Journal in particular for practical subjects. PE, Food Tech, Art, Science and Technology are all areas that could benefit from this type of learning journal. This is not to say other areas would not benefit but practical areas lend themselves to recording evidence of learning through photos and video. 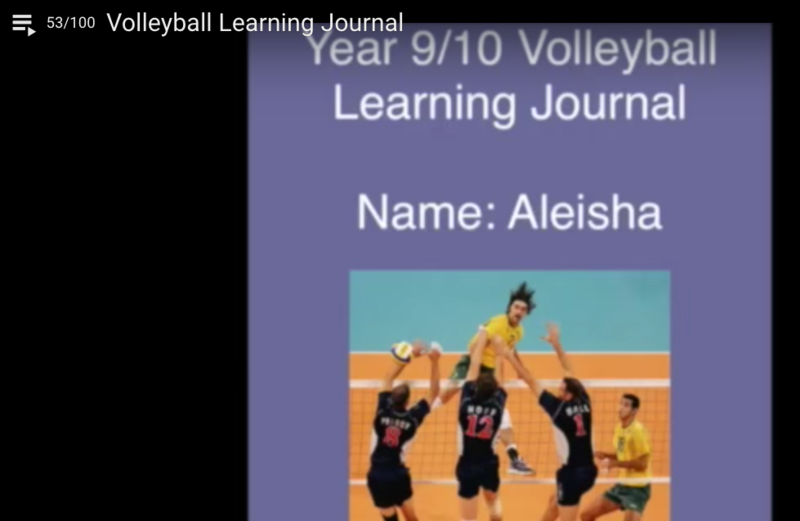 The example below is a learning journal for Year 9/10 PE (Volleyball). A simple explanation of this journal is that it provides task outlines, success criteria , images and video that support those criteria and spaces for students to insert video and text explaining their learning. I have also created one for my 7/8 Badminton class. Of course there are hurdles to over come to make this work. Students need access to the same iPad, not every lesson but on a regular basis during the term. The teacher has to create the learning journal in Book Creator and Airdrop (or FileBrowser) it to Book Creator on all student iPads . Students need time in lessons to complete journal work (hwk not possible using school iPad). Students need the opportunity to back up their journal on a regular basis to their student folder using File Browser incase their book is erased (accidentally or intentionally). Students will need assistance and scaffolding to help them use apps like Book Creator and iMovie as well as any other app that might be used to create content for the journal i.e. Popplet and Explain Everything. Once students have completed their journal the easiest way to hand it up is to Airdrop it to the teachers iPad (teacher opens in iBooks). This could potentially cause another issue as so many journals containing video will require a certain number of Gigabytes of free space on the teachers iPad. However if this is not a problem then the teacher now has access to all the students journals in their iBooks app. Note: Students should also upload a copy of the ePub file to their student folder using the File Browser app. This allows the book to be deleted from the student and teacher iPads in the future while still providing access to it if needed i.e. a parent teacher interview. It will be interesting to see how this process works. It is the first time I have tried it on a large scale (46 students across two classes). This entry was posted in Assessment/Reporting, Health & Physical Education, Pedagogy, Technology, What's happening in classrooms? and tagged assessment, Book Creator, iPad, iPad apps, pedagogy, Physical Education.